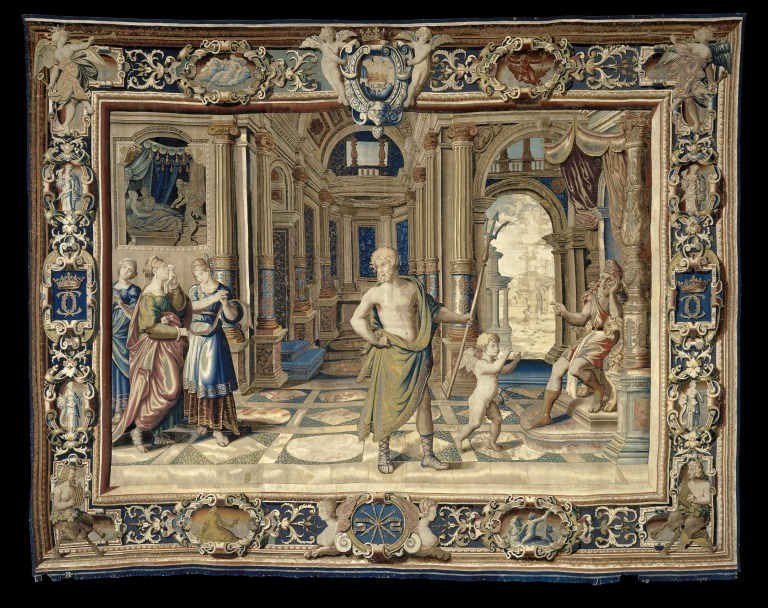 This tapestry is from a set that was intended to be portable. It would have been carried between the palaces of Charles I (ruled 1625-1649) when he changed his current residence. In this period they would have been attached to the walls by their top edge only. The tapestry workshop at Mortlake near London was established by Francis Crane (1579-1636) under the patronage of James I (ruled 1603-1625). Fifty Flemish weavers and their families were brought there in 1620. 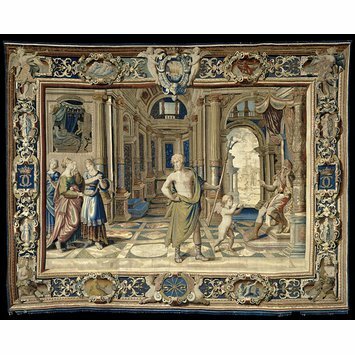 Through their skill and the advantages of Royal involvement, during its first twenty years the workshop produced some of the finest tapestries in Europe. The scene is from the mythological story of Vulcan, the god of fire, and Venus, the goddess of love. The tale was told in The Odyssey by the Greek poet Homer. Venus and her lover Mars, the god of war, have been imprisoned by her husband Vulcan, who sits in judgement. Neptune, god of the sea, and Cupid, god of love, plead for the lovers, while the Three Graces weep for them. The areas of flesh on the figures were the most skilled and therefore the most expensive parts of the tapestry to weave. The V&A has a tapestry with another version of this scene in which Neptune and Cupid are both clothed. Presumably this was commissioned by a client who could not afford so much expense. 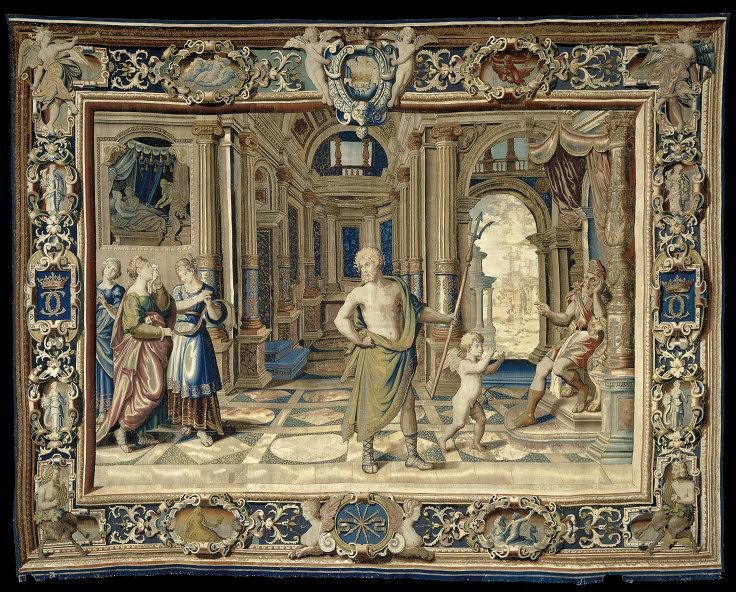 Tapestry of 'Vulcan and Venus; Neptune and Cupid plead for the lovers'. The scene shows the middle of a hall in Vulcan's palace where Neptune stands looking back over his shoulder at the three Graces who bewail the plight of Venus. In front of Neptune, Cupid approaches Vulcan, asking for the release of Mars and Venus. Vulcan sits at the far right beneath a canopy of state between bulbous columns with renaissance decoration. In the background, at the right, an open archway reveals classical buildings in the distance and the small figure of a man. Behind Neptune is a closed perspective of columns and pilasters. Through a window in the top left corner, Vulcan is seen rehearsing his wife and her lover from the net. The border shows; top centre - winged boys support a cartouche with the Prince of Wales' feathers. Bottom centre - Sphynxes flank the 'Sceptra Favent Artes' motif. Sides centre - Interlaced 'c's with a princely coronet. Top corners - Frame with trumpet. Bottom corners - Satyr with pan-pipes and bagpipe. Four medallions with Ceres are at the sides, four medallions with gods of the elements - Juno, Jupiter, Cybele and Neptune, are at the top and bottom. Tapestry, 'Vulcan and Venus', Mortlake, England, ca. 1620-1625.